I'm back from a great couple of days visiting students in Wales. The Student Research Conference for accelerated students from Bangor and Cardiff University of was a real success. The students did an excellent job presenting their research proposals and the 1st years in the audience were so supportive and maximised the opportunity to pick up tips for their turn next year. The venue, Gregynog, is an amazing half timber building near Newtown, and the fact the event is residential enabled the students an staff teams from the two universities to come together and swap stories and network over dinner (and glass of wine!). On Thursday morning, I headed off to Wrexham to visit the students on part-time programme at Glyndwr University. I wish I could have stayed for their afternoon session as it was the OT philosophy - which would came in very handy for my assignment! However, I was back on train...and completed my 8th train journey in approximately 48 hours - with only a 6 minute delay overall!!! 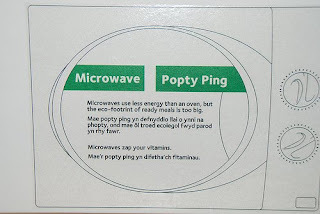 While I was away I discovered the Welsh for microwave is "P opty Ping" - there is no going back for me...it shall be the Popty Ping for evermore! Just a note to say that I am loving your blog! It can be difficult to keep up blogging if you aren't sure who is reading and I know from experience that comments matter. Hopefully more people will leave a word or two soon. Thanks Sarah. I accidentially deleted my widget that enables me to view the location of people viewing my blog...but the weeks I had it...it helped illistrate I wasn't blogging to myself!!! It is quite scary..but the link to my blog will be printed in the next edition of OTN on the student page!